The roof plaques in the Osmania General Hospital here fell once again and the staff has demanded re-construction of the building as the hospital's infrastructure is in a sorry state. Speaking to ANI, Telangana Junior Doctors Association (TJUDA) President Dr P S Vijayender stated that the roof plaques in room 502 Department of radiology in the old building of Osmania Hospital fell the day before yesterday. "Fortunately no one was injured in the incident. This was noticed by women staff. Earlier we have staged protests many times to reconstruct the building demanding safe working atmosphere for both the staff and patients. The incident came to light today after it went viral on social media," he said. A few days ago, the doctors of Osmania General Hospital had staged a unique protest by wearing helmets while they treated the patients. The video went viral on social media. 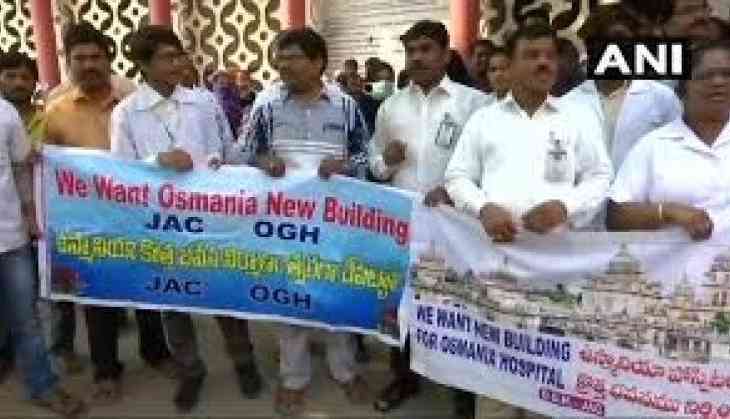 Earlier, the health minister of Telangana had responded to the protests and assured of construction of a new building for Osmania hospital but it was not fulfilled. Last year, TJUDA had staged protests demanding the construction of a new building. "The century-old in-patient building is in a dilapidated state, and the situation is no different in the Out Patient building," Dr P S Vijayender had said. Vijayender had also stated that Rs 200 crore was sanctioned in 2014 by the then Chief Minister, Kiran Kumar Reddy, for the construction of a new building. However, the funds were kept unused and got added to the next financial year's budget.